Sitting down to a bottle of M2 wine and BBQ pork ribs, we sipped, wondering what that taste was, black licorice? We couldn’t nail the taste, but we knew the 2012 Clockstopper Red Wine from M2 had been a good choice on our recent tour through Lodi. Clockstopper is billed as a blended red with grape from California’s Sierra foothills and Lodi. We first visited them several years ago, dropping down from California’s Gold Country into Lodi. We walked into three deep crowds, not knowing it was First Taste in Lodi, a yearly event with wineries offering the first chance to visit new vintages. We found every winery packed with folks from Lodi, Sacramento and the Bay Area flocking into town for the big show. We could hardly wiggle our way into a bar. 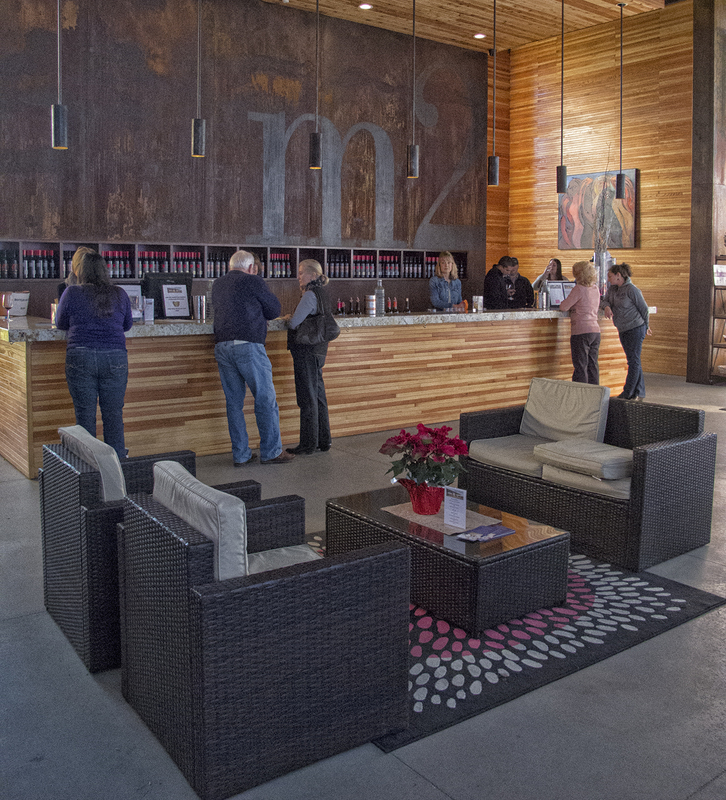 We were impressed with M2 wine and purchased several bottles during that visit. Fast-forward several years later and they moved out to the country from their old facility residing in a industrial park south of the water treatment plant. The winery was named after two winemakers with names starting with the same last letter, M, thusly M2. But one of them has left and there are no longer two M people there, but the name remains the same. Layne Montgomery continues as the winemaker and owner, pressing interesting vintages from the loam of the California’s central valley. Their new facility is north of town in the middle of grape fields and is an eclectic display of raw steel with rust patina. The east side of their barrel room (open during our visit) is a production and storage facility. On the west side is a very large, hip and cool tasting room with bar height tables, couches and a room length bar. The facility is fun and impressive. Immediately surrounding the building are new grape plantings for estate wines (three years away.) Surrounding vine of more mature plantings are not part of the winemakers inventory. As we stepped up to the bar we found Tom, with whom we visited on the previous day at McCay Winery. There were three other hosts, all over the age of 35. They were all experienced and knowledgeable about the wine, no $8 an hour kids here. M2’s winemaker is creating very distinct blends, he has a very distinct palette and is a ‘must taste’ while visiting Lodi. Every once in a while you find somebody exploring and creating interesting wine outside the norm of the terrior in which they work. Layne Montgomery is one of those individuals. We will offer one criticism of the winery – spitting cups and the lack of them. They had a hard time finding an opaque glass or cup. Bill ended up expectorating into clear wine glasses. A party of seven or eight young 20 somethings we’re not comfortable with him spitting in his wine glass, but that’s the way it goes while you’re tasting wine. Our suggestion is to offer the same thing many other wineries in California offer, plastic cups that can either be disposed of or washed, depending on the winemakers sense of environmentalism. You’ll find M2 north of downtown 2900 Peltier Road in Acampo, producing 3,500 case of wine yearly, thusly you’ll not find them in big box retailers. You owe it to yourself, visit and experience their wine. This entry was posted in Blend, Lodi AVA - Home to 80 Wineries, Lodi North Eastern Quadrant Day Tours, Lodi North Western Quadrant Day Tours, Petit Sirah, The Pleasures of Tasting Wine, Zinfandel and tagged bottle, bottle of wine, california, lodi, wine, zinfandel.